Transparency Market Research (TMR) has published a new report titled, “Virus Filtration Market - Global Industry Analysis, Size, Share, Growth, Trends, and Forecast, 2018–2026”. 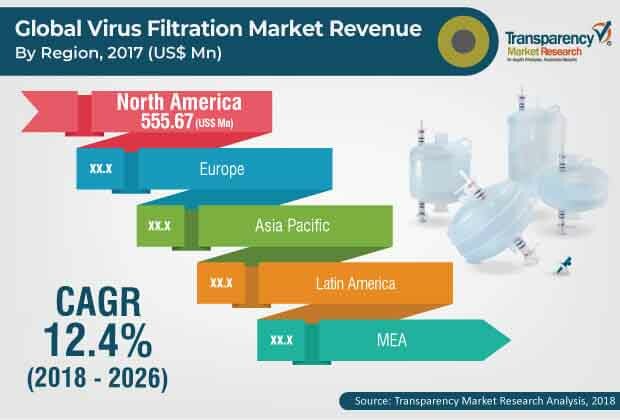 According to the report, the global virus filtration market was valued at US$ 1,238.3 Mn in 2017 and is anticipated expand at a CAGR of 12.4% from 2018 to 2026. Increase in the number of biotechnology and biopharmaceutical industries in emerging economies in regions such as Asia Pacific is expected to drive the global market. Moreover, rise in investments in R&D by public and private sectors is projected to augment the global market between 2018 and 2026. The exponential growth of the biopharmaceutical and biotechnology industries is expected to drive the global virus filtration market, as virus filtration products are extensively utilized in these industries to obtain products free from any form of contamination. The biopharmaceutical industry generates revenue of US$ 163 Bn globally i.e., around 20% of the pharma industry. Furthermore, supportive regulations, funding, and numerous R&D project allocations by government as well as private establishments are expected to augment the market. Increase in investment in research has significantly contributed to the advent of new technologies which are utilized in the manufacture of new filtration products with better capability to filter minute structures, ranging from particles to microorganisms, including bacteria and viruses. In order to be competitive in the market, companies focus on R&D activities by allocating more resources both in terms of investment and trained workforce. Moreover, rise in adoption of biotherapeutics has led to research, development, and formulation of new drugs derived from natural sources to treat various forms of chronic disorders. Continual increase in investments in R&D is expected to propel the global virus filtration market during the forecast period. Production of medications, drugs, and therapeutics such as biologics and others is monitored by regulatory authorities to assure safety against viruses at different stages of manufacturing. Contamination of biological therapeutics by viruses which are endogenous to the cell lines and other adventitious viruses which are introduced during the stage of manufacturing is a major concern during the synthesis of drugs. Hence, stringent rules and regulations by various regulatory authorities is anticipated to hamper the growth of the global market. In terms of revenue, the virus filtration market in Asia Pacific is projected to expand at a CAGR of 13.8% during the forecast period. Rise in awareness about the advantages of biotherapeutics is anticipated to boost the growth of biopharmaceutical industries. Furthermore, favorable trade laws, availability of cheap labor, and increase in population are expected to propel the virus filtration market in the region in the next few years. The report also provides profiles of leading players operating in the global virus filtration market. These include Merck KGaA, Asahi Kasei Corporation, Sartorius AG, General Electric, Thermo Fisher Scientific, Inc., Danaher, PendoTECH, Lonza, Charles River Laboratories, and Medical Respiratory Devices. Launch of new products, focus on developing technologically advanced products, and supportive regulations from government bodies are expected to drive the global market during the forecast period. For instance, in February 2017, Merck introduced Viresolve Barrier capsule filters, which has application in the upstream bioprocesses and is expected to reduce the risks of contamination in bioreactors from viruses, mycoplasmas, cell culture media, and bacteria. In June 2016, Sartorius Stedim Biotech (SSB), a subsidiary of Sartorius AG, launched its product Virosart Media, for the purpose of retention of virus in cell culture media.